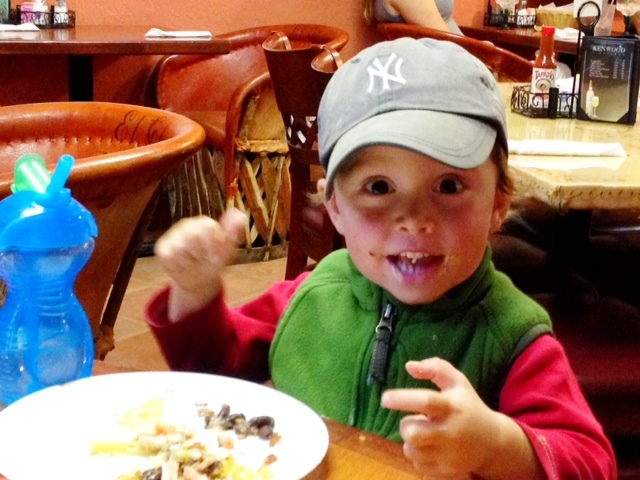 Van Enjoying One of His Many Meals out in the San Fran Area – thanks Jess for the great dinner and the pic! In my last post we were leaving Washington, which feels like ages ago. Probably because it was. We spent three weeks in Oregon and two weeks in California since we saw Mt. St. Helens. We’ve had some ups and downs along the way – the most significant down being when Alan sprained his ankle – but we’re still trucking along. One of the big ups was a jam-packed week full of seeing friends. We had plans with different people every day for six days straight! It was a bit of a whirlwind (and part of the reason I haven’t had time to post anything on here), but so refreshing to see wonderful friends in the San Francisco area. We’re now headed further south, but I thought that it was about time for another “Lessons Learned” post. I’ve been spending a lot of time in my head lately as we think about our transition to a more stationary life, and hence the lessons keep piling up. 1. I would rather spend time with someone who thinks deeply about issues and disagrees with me on every point than someone who follows a set script of ideas and agrees with me on everything. I’ve thought this before, but never with such intensity. In finding a place to live, I realize that I was focused on finding a place with a community of like-minded souls. But really, I should just be looking for a place where people care and connect and think, regardless of whether they’re like-minded or not. Besides, it’s not like my views fit some mold, and they differ plenty from Alan’s. That’s part of what we love about each other. We push each other to think deeply about things from many angles. I’d love to live somewhere where I’d have the opportunity to do that with people of all stripes. This is increasingly important as our politicians become more polarized from one another. 2. Full moon + fog = A very bright night. Since we’ve been in the San Francisco area for the past week or so, we’ve experienced the morning (and overnight) fog. Our visit happened to coincide with the full moon. If you get lost in the woods at night without a flashlight, wish for a full moon and fog. It lights up the sky like no other. It creates a great effect, but also tends to make little boys restless sleepers. Oh well! 3. After living on the road for so long, washing dishes with a faucet and hot water feels similar to a spa experience. No joke! I could have washed dishes in our portable “sink” with cold water, as we’ve been doing for months. But there was an outdoor sink with hot water just down the dirt road. I made that walk – several trips for each meal – just to feel the hot water over my hands as I scrubbed each dish. Well worth the walk! 4. California is expensive. Not sure what else to add here, but this state has been making our bank account balance fall faster than any other state. I’m not sure there’s even been a close second on this trip. As an example, state parks campsites have been averaging $35 a night! Insanity! Needless to say, we’ve been enjoying our first private campgrounds with more amenities for a similar price. 5. The colors of the Pacific Ocean are brilliant. I grew up with the ocean – the Atlantic is my ocean, and always will be. But the colors of the Pacific are amazing. The blues, the greens, only once did I think the color looked similar to the blue-gray I’m used to on the East Coast. I could look at the Pacific for hours. 6. Letting a two-and-a-half year old hold sticks (or pinecones, or acorns, or…you name it) near your car is a bad idea. Lesson learned the hard way (check out the nifty scratch on the side of our car), but luckily before he had his way with someone else’s car. 7. When packing to camp, take half as many clothes and twice as many socks and underwear as you think you’ll need. We’ve become experts at wearing things over and over, making the spans between laundry visits that much longer. Whereas we used to do laundry when we were running low on clothes, we economize our clothes so well now that we only have to do laundry when we’re low on socks and underwear – the true necessities. 8. 45 degrees at night is not too cold to camp with a toddler. Neither is 35, for that matter. 25, that’s another story. I’ve had a few people (including a park ranger) tell me that 45 degrees is too cold at night for camping. 25, I agree, although we’ve done it. But 45? No problem! As long as you bring the right clothes, 45 can be downright toasty! Alan and I are notorious for keeping our thermostat pretty low in the winter. I’m wondering what effect this trip will have on our thermostat once we return to living in a house. 9. A home is one of the most wonderful things in the world. If you’re reading this and you live in a home, be it an apartment, a house, a cabin, or even a home on wheels, take a look around you and realize how lucky you are. I am craving a home and all that comes with it. Warmth, protection, a place to prepare meals and lay your head at night, a nearby community of people who care about you, a plot of land to cultivate, a furry friend (Hickory, to be specific) to curl up with, and family. I have the last of these covered, but I am so looking forward to the rest. When we finally do have a home, I hope that I never forget to feel grateful for all that we have. On that note, I am so, so grateful right now for the time that I’ve had with Alan and Van on this trip thus far, the time we’ve had with friends and family, and the opportunities to see and do new things every day. There can be days when it’s tiring or hard, but most of the time, it’s amazing. And I feel so lucky to be able to share this journey with my two favorite people. Even as I begin to long for a home, I am so thankful to have the opportunity to live one of my dreams every single day. Here’s to hoping that we all have many more days of living our own dreams, whatever they may be.